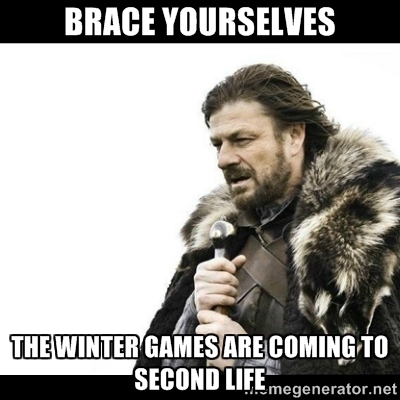 The Winter Games begin March 15th, and go through the 22nd. Registration forms have started going out to interested communities. Sign your people up for exciting competitions: ice hockey, ski jump, curling, snowboard half pipe, slalom skiing, downhill ski races and snowboard races, and speed skating! Also, there’s room to sign up your DJ’s and musicians if they’d like to play at the lovely venues at Chamonix City. If you haven’t already contacted myself or Marianne McCann about participating, please leave us a message inworld and we will get you a registration form. The deadline for registering is February 28th. Exciting things are coming! Drewski Northman of the East River Federation and Marianne McCann of Bay City, along with the Chamonix City administration team, are honored to invite the communities of the grid to take part in the First Winter Games in Second Life. In 1924, Chamonix-Mont-Blanc in France played host to the very first Winter Olympics. It is fitting, that 90 years later, Chamoix City, home of the Global Online Hockey League, has graciously opened their doors to host the very first Winter Games in Second Life. Chamonix sits in the historic Snowlands region of Sansara, where Winterfest was hosted by the Lindens in years past. Now, it is up to the communities of Second Life to come together in cooperation (and some friendly competition) to make this yet another special event. WHAT IS THE GOAL OF THE GAMES IN SL? The goal of the first Winter Games can be summed up in one word: community. SL is at it’s very best when a community bands together to produce wonderful creations, tell compelling stories, or host fun events. The Games allow communities of all stripes, Steampunk, Retro, Bohemian, Metropolitan, Futuristic, to come together on common ground to compete, interact, and showcase what makes their community special. Along with the athletic events, there will be a Cultural Exchange Center that will allow each community to set up an informative display for others to see. -Exciting Wintersports: hockey, downhill and cross country skiing, ski jumping, snowboarding, half-pipe, curling, figure skating, and more. -Social Events: Chamonix City will be bustling with live music, DJ’s, and parties at all hours of the day. Watch some sports (or compete!) then party with friends, or make new friends from distant places. -Cultural Exchange: Come learn about dynamic communities represented in the Winter Games. Perhaps you will find a new home! *Official dates in March are forthcoming, and will be announced soon. **Events and features are tentative, and may be subject to some changes.